Cocker spaniel adoption is becoming more and more popular, and it’s hardly surprising is it? Just take a look at them; they’re beautiful and with such a loving temperament, who could resist? Why not let me try to persuade you to adopt a Cocker Spaniel before you decide to buy? 5 Excellent Reasons To Adopt A Cocker Spaniel! Dog adoption is becoming increasingly popular, and it's just as well because there are literally thousands of Cocker Spaniels abandoned by their owners each year. (Reasons why are explained below). Whilst Cocker Spaniel puppies sometimes find their way into rescue shelters, it's not often, but when they do, they don't hang around for very long. It's usually adult Cockers that are left waiting for forever homes. Most vets refuse to euthanize an otherwise healthy animal which means that many pets end up in Cocker Spaniel rescue centers, animal shelters, and adoption centers across the country. And there they sit, confused and sometimes frightened, and simply wait for someone to choose them and take them to their 'forever home'. I'm sure there are many more than five reasons to adopt a Cocker Spaniel, but here are the five I promised! Cocker Spaniel Adoption: 1 - You're Saving A Dog's Life! Unfortunately, not all rescue centers are able to house their dogs indefinitely because of limited funds and resources. Unfortunately, this often (but not always) means they're forced to put the poor animal to sleep if it's not re-homed quickly. If you adopt a pet, you could well be saving his life - literally - and in my book, that's one very good reason to adopt a dog! Cocker Spaniel Adoption: 2 - You're Saving Money! If you adopt a cocker spaniel, you'll be saving yourself a whole heap of cash! Because adopting is cheaper than buying a dog from a breeder, it makes it much more affordable. You'll also save in vet's fees because a rescue dog will have already been checked over by a vet, (so you can be certain he's fit and healthy) and he'll be up to date with his vaccinations too. The dog is more than likely to have been wormed and treated for parasites and may have been spayed or neutered, and I know from experience that this can save you hundreds! Your new pet may even be micro-chipped too! Cocker Spaniel Adoption: 3 - He's The Finished Article! When you rescue an adult dog, you'll know exactly what you're getting; he'll be the 'finished article'. He'll be fully house-trained, probably crate trained too, have learned how to walk to heel or on a leash, and will probably have passed his obedience training, hopefully with flying colors! Your adopted Cocker will have already been socialized and will be comfortable around most types of people and in most circumstances - very little flusters a dog that's been properly socialized. He'll have grown through the puppy phase (so no chewing or nipping) and because he's older, he may be slowing down and less energetic and not so phased by kids, especially if his previous home involved children. He's been there, done that, and is now ready to be your new 'best buddy'. 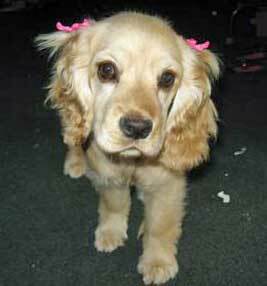 Cocker Spaniel Adoption: 4 - Sidelining Puppy Mills! By adopting a Cocker Spaniel (or any dog for that matter) you won't be supporting puppy mills. These mills (also known as puppy farms) are breeding factories where the puppies are churned out at a frightening rate. The owners don't care about the welfare of either dogs or puppies (who are very often kept in terrible conditions) and these people are in business simply for the profit! You can usually spot a puppy farmer a mile off, however, sometimes it's not that obvious unless you know what to look for. A puppy's temperament has yet to develop, making it difficult to appreciate how they are going to behave around children or other household pets. Whereas, an adult Cocker's characteristics and temperament will be fully developed, allowing the staff at the dog adoption center to assess personalities and recommend a Spaniel with a temperament and disposition that will suit you and your family circumstances perfectly. If you've never owned a dog before, this is ideal. Why Do Owners Abandon Their Pets? You may well ask how anyone could ever abandon their own pet, but there are often many circumstances which can lead to a dog ending up in a pound. Some of these reasons are understandable, some not so understandable, but they're always tragic and unfortunate. A change in job may result in the need for extensive travel or to stay away from home for long periods of time. If they're unable to take their pets with them, what then? The same scenario may apply if a couple decides to split up. When families break apart it's not only the children that suffer, pets do too! 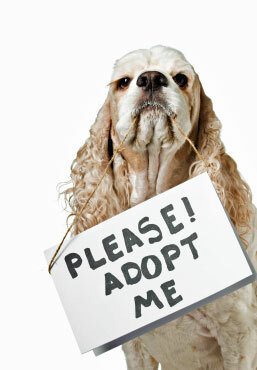 The bottom line is that 99% of all Cocker Spaniels in adoption centers are there as a result of their owner's circumstances, NOT because there is a problem with the dog. Moving to an apartment or rented accommodation that isn't pet friendly. Very often, people think that dogs in adoption centers are there because they're unmanageable or have behavioral problems. We've seen from the above that this is not always the case and that there are many different reasons why Spaniels are abandoned by their owners. There are several places where you may find your perfect dog or puppy. A good source of pets for adoption can be offered online. These sites can often list thousands of dogs in their database, with accurate, up-to-date information on dog rescue centers, by breed. 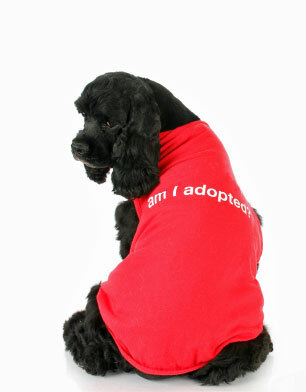 There are many adoption centers both in the USA and the UK and they can easily be found by doing a web search for terms such as: cocker spaniel adoption, dog adoption center, adopt a cocker spaniel, adopt a dog, pet adoption, etc. Search the World Wide Web for Rescue Cockers! Your vet may know of a Cocker that's in need of re-homing, so why not check with them first? Keep an eye out for adverts in the local newspapers too. Occasionally, a caring owner will place an advert in a local paper or supermarket in a bid to find a new home for their beloved Cocker Spaniel, rather than place him in a rescue home. 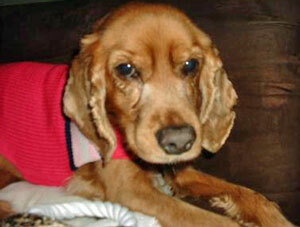 This is likely to be a great source as this owner very obviously loves their pet and will have taken good care of him. It's also likely that this dog will be healthy, well-mannered, and without behavioral problems. I can't endorse any particular rescue center, but I do recommend that you 'vet' them carefully. I'd just like to emphasize that not all Cockers are re-homed because they are problem dogs. As you've seen above, many are placed into shelters because their owners are no longer able to care for them. There may be one or two dogs that have been removed from an environment where they have been ill-treated or weren't socialized or trained properly. In these circumstances, the dog may well have some behavioral problems, and it's entirely possible (with lots of love and affection) to retrain these dogs. The staff at dog adoption centers will normally have a history or at least a little background on the dog to be re-homed, and will let you know if there are any issues to be worked through. The volunteers will do their utmost to match you with a Cocker Spaniel that will be perfect for you and your family circumstances. Cocker Spaniel adoption is definitely the way forward, so go on, what are you waiting for? Our visitors often drop me a line to let me know about their Cocker Spaniel adoption or rescue stories, some are very sad, but mostly they have happy endings! Here are a few of those stories for you to enjoy and if you'd like to submit your own (and a photo of your dog) just click on the link in the green box below. I rescued a partially blind Cocker Spaniel pup. Unfortunately, she's blind in her right eye, therefore she runs in circles. She leads with her left eye and normally walks in a counter clock-wise circle, although when she's chasing the cat she manages to run after her in a straight line! It's been amazing to watch Squirrel grow and adapt to life and her surroundings. Hi! I'm Nitro. I'm a 4 year old black Cocker Spaniel and I was rescued (from an abusive owner) from the pound. I was very lonely at the pound but then my luck got better when I was adopted. Now I'm living the life I always wanted - thanks to my new, caring owner! I recently rescued a five year old miniature female cocker spaniel. She is so adorable but unfortunately she's so unhealthy. Vet expenses are never in anyone's budget, but I don't see an end. I had to spend $1,600.00 for a blood transfusion and medications and we still have a long way to go. Because she was neglected, I am faced with a very severe case of Cocker Ears, to the point where surgery is the only option besides putting her to sleep. It breaks my heart to have to make a decision like this, it's so unfair. I rescued her and now I don't know what to do. She is so sweet, (she only weighs 16 lbs) and loves to play and she never barks, what more would you want in a dog? I have a week to decide what to do, but I have to get the bacterial infection under control first. Wish someone could give me guidance on how to make the right decision, let alone how to pay for it, any help would be appreciated, my tears have almost dried up from the crying. This Thanksgiving was a very special one - we welcomed Zoi, our 9 year old English Cocker Spaniel to our home. Whilst she is a gorgeous dog, she does have some underlying issues. Overall, I would say she is a great dog, but she tends to do some "bad" things. These things include peeing inside when excited, wanting to eat table food and nearly rejecting dog food (mostly dry) at all costs, and not heeling during walks. While I know these things can be modified, I really want her to start listening. She knows how to sweeten me up that's for sure. If you'd like to read some of our visitor's Cocker Spaniel rescue stories, or you'd like to add your own, simply follow this link.